Will the Longest Ride of Their Lives Also Be Their Last? Can you ever put a price on your own life? Is there a right or wrong way to act when fear overtakes you? Does it even make even a difference? Those are the questions posed by "The Wages of Fear," a gripping 1953 French film that lives on today through The Criterion Collection. In a dead-end town somewhere in South America, the desperation is as thick as the heat and as biting as the mosquitoes. Mario (Yves Montand) attracts the attention of an older drifter named Jo (Charles Vanel). Mario is young, strong, and strapping, but also somewhat scruffy; Jo is bombastic, immaculately dressed, and carries himself with a puffed-up air of authority. They're both French and forge an immediate connection because of that. We also meet Mario's Italian roommate, Luigi (Folco Lulli), who develops an immediate dislike for Jo. Does Luigi sense something that Mario doesn't? There's also a Dutchman, Bimba (Peter van Eyck), and an American, Bill O'Brien (William Tubbs). The first hour or so of the movie is spent just lingering around and capturing various conversations. This slow start is instrumental in building characters, establishing their personalities and motivations, and showcasing the town as the last stop on the road to nowhere. The area, so hot and impoverished, almost becomes a character in itself. What everyone needs is money and a way out. Finally, an opportunity comes – courtesy of O'Brien – that will grant both. But there are no guarantees – it's basically a suicide mission. Four men will be chosen to drive two trucks containing extremely sensitive, highly explosive cartons of nitroglycerine. However, these vehicles don't come with the standard safety features. Going too fast or too slow – or even one bump on the road – could spell the end. What kind of man would accept such a mission? Only one with nothing left to lose. This town is full of such people. Believe it or not, the job is so coveted that one of the men seemingly pulls off some shady shenanigans in order to secure his spot on one of those trucks. 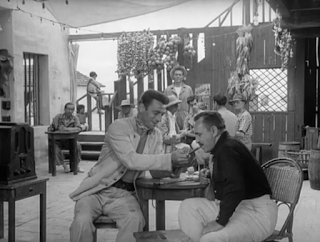 "The Wages of Fear" is initially wide open, taking you through an entire town: its sights, its airy skies, and many of its inhabitants. But as soon as those trucks rev their engines, the scope of the film becomes much narrower and far more claustrophobic. Its focus shifts solely to the drivers and their potentially fatal job. With every tense mile comes the possibility of impending doom. By now, we know who these people are – or at least we think we do. Fear casts an overwhelming shadow, and what makes the movie fascinating is how everyone handles it. The acting is stunning all around. Their faces and eyes tell more of a story than dialogue ever could. 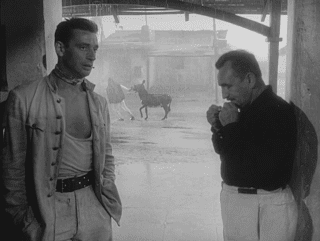 Sixty years later, "The Wages of Fear" is still regarded as a timeless masterpiece. It's easy to see why. There may be no finer example of the physical, mental, emotional, and psychological toll that fear can take on a man. By the time it was all over, my knuckles were sore and bleeding.